Quick HEADS UP! I created a free webinar just for influencers that gives you my 5 steps to land brand collaborations, media and negotiate your best rate possible! Something that I see online A LOT when it comes to social media and marketing is "How to Get More Followers". This is also one of the top questions (along with how to make money on social media) that I see come up A LOT in The Influencer Podcast Facebook Group. So, obviously how to grow your following is something that is really important to influencers. 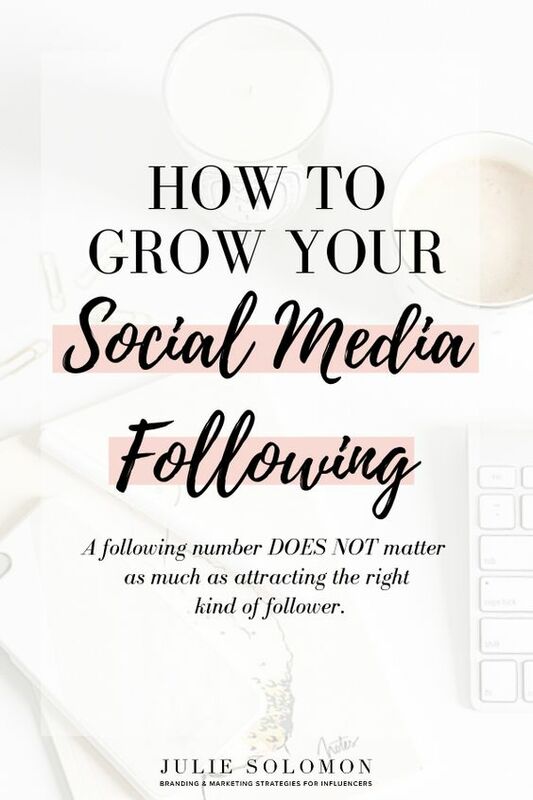 I kind of get annoyed with the whole "one size fits all/ this is all you have to do to grow your following" because I don't believe that the following number is the answer to real long-term growth and profitability on social media. Now, of course, if you are an influencer you need to have more followers...and I want this for all of us. But, I want to make sure it's the RIGHT followers. A following number DOES NOT matter as much as attracting the right kind of follower. Who cares if you have 500,000 followers when only 10 of them are genuinely excited, engaged and supporting what you are influencing online? I would rather have 50 followers who were true supporters of my tribe and will always drink my social media kool-aid over half a million who are out to lunch 99% of the time. Can I get an amen? The more you can focus down on your ideal follower, the more you will be able to attract these followers. This is what you need to do in order to grow your social media following, the right way. Why? The answer is simple. ENGAGEMENT. Social media platforms, like Facebook and Instagram, have become so insanely saturated (1 billion people active on Facebook; around 700 million active on Instagram) that it's almost impossible to be seen if you don't have a super engaged following. Hello, algorithm! Therefore, if you have 1,000 and get 100 likes and 20 comments vs someone who has 10,000 followers that gets 100 likes and 20 comments. The account with the smaller following is what the social media platforms will promote more since that accounts engagement rate is higher. Therefore, you must cultivate followers who are authentic, engaged, and with you for the long haul, which leads to more profitability. If you are not consistent with the branding/content you put out, if you're visual are all over the place (meaning, they do not create a streamlined, 360 view of your brand), you only write posts that are one sided, only about you and do not create a 2 way conversation...your social media efforts will fall flat and you will not grow long term. Period. I do not mean to come off harsh, but I want to be crystal clear with you on the importance of these 3 points. These are so incredibly vital to the long term growth of your social media platforms. It may not happen overnight, nor should it if you're really growing the right way, but you should start to see a consistent incline of growth if you hit these 3 points correctly. 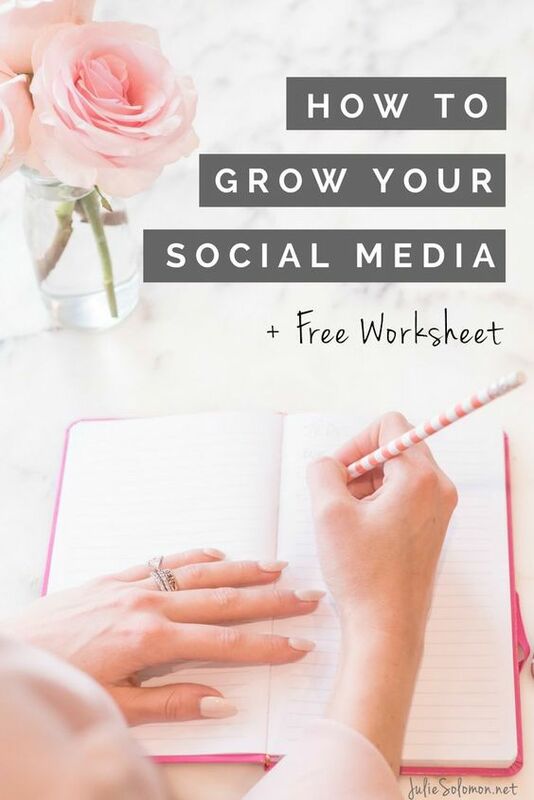 For tips on how to do this, download the worksheet below, which gives you consistent steps at growing your ideal following on social media. If you want to learn more about how to grow your social media following, and how to land deals from it, I encourage you to check out Pitch It Perfect, a course I created that helps you land your first $5K in brand deals, attract more followers and pitch like a pro! What are ways you grow your following on social media? What have you found that works well, and what have you found that doesn't? Any advice to share with us? Please leave your comments and thoughts below by clicking the "comment" button at the bottom. I’m hoping you’ll do the same! Please, introduce yourself on Instagram, Facebook, Pinterest, Twitter. Success! Now check your email for your tips!